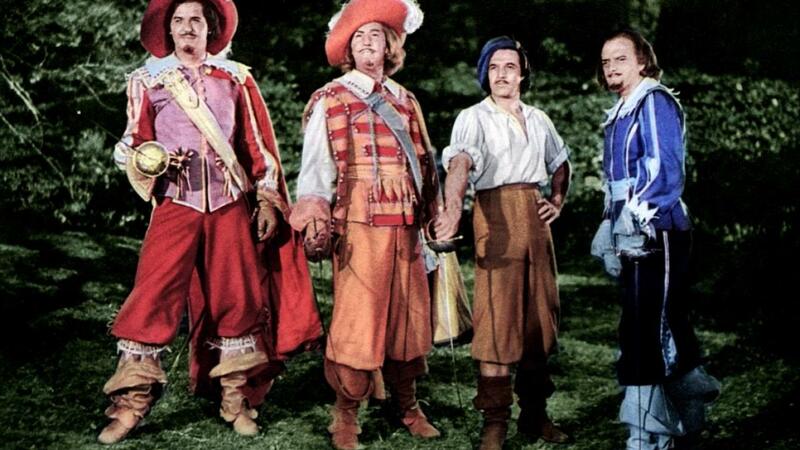 A swashbuckling adventure, The Three Musketeers is reasonably entertaining but undeniably frazzled. It's the 1600s in France, and d'Artagnan (Gene Kelly) leaves the countryside and heads to Paris, seeking to join the elite Musketeers, who form the King's guard. He proves his swordsmanship in a battle alongside Athos (Van Heflin), Porthos (Gig Young) and Aramis (Robert Coote) and joins them as they defend the King (Frank Morgan) from evil plots. The main threat is posed by the nefarious Prime Minister Richelieu (Vincent Price), who is seeking to trigger a war with England and regularly conspires with Milady, Countess de Winter (Lana Turner). d'Artagnan meets and falls in love with Constance (June Allyson), who is one of the maidens of the Queen Anne (Angela Lansbury). The Musketeers set off on a mission to England to retrieve jewels from the Duke of Buckingham (John Sutton), but that is just the start of many adventures to try and thwart the persistent Richelieu. 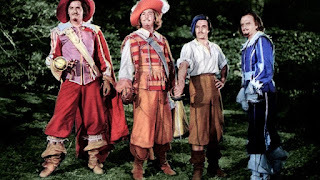 A disorganized mess of a film, The Three Musketeers just about scrapes through. The energy level is admirably high and athletic swordplay setpieces erupt at regular intervals. Yet a lack of tonal cohesion, weird casting choices, characters rotating in and out of the movie with no explanation, plot points that border on incomprehensible, and plenty of seemingly important action occurring off-screen all combine to create a disconcerting experience. Most of the trouble originates within a lazy script intent on thoughtlessly cramming too much of Alexandre Dumas' episodic stories into a two hour movie. With no appreciation for the need to focus to achieve depth or cohesion, the film thrashes around in shallow waters gasping from one side quest to the next, barely explaining why everyone is running around, or even who everyone is or why they matter. Director George Sidney cobbles together enough swashbuckling sword fights to paper over most of the cracks, with Gene Kelly's athleticism put to great use. The lavish sets, locations and costumes often look gorgeous in technicolor, and a certain level of joie de vivre helps hustle the film along. Gene Kelly as d'Artagnan and Van Heflin as Athos seem to be acting in two different movies. Kelly is all smiles as he peddles a light hearted attitude and half-threatens to break out into a song-and-dance routine at every opportunity. Heflin is dour, reflective and dramatic as he pauses often to drone on about his lost love. Porthos and Aramis barely register as the other two musketeers, but the ladies fare worst of all. Lana Turner is top billed but her role is almost incidental, June Allyson as Constance is both mis-cast and underwritten, and Angela Lansbury's Queen Anne is detached from most of the various plots. The Three Musketeers gallops across the landscape with impressive bravado, but forgets to bring along any sense of structured significance. This is my favorite version of The Three Musketeers. Though I'm not sure that's saying very much. 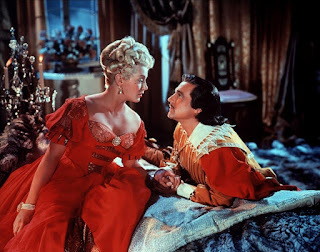 What puts it over the top for me is Lana Turner as Lady de Winter. She's great and gorgeous! There is plenty to admire in the film, but at the same time a lot of it just does not hold together. I can't remember if I've ever seen any of the many other versions; I'll get to some of them eventually!